Parcel from Amy Schimler, originally uploaded by indiaeden. I've been feeling really yukky this week. I started the week with an awful sore throat,swollen glands etc,but determined to ignore it...that's what us Mum's do isn't it? No time to be ill! i did manage to get through most of the week,but yesterday it all caught up with me and I was in my pj's by 6pm,and in bed by 8pm feeling very fluey and ill. This morning though I've got up to two lovely parcels to cheer me up. 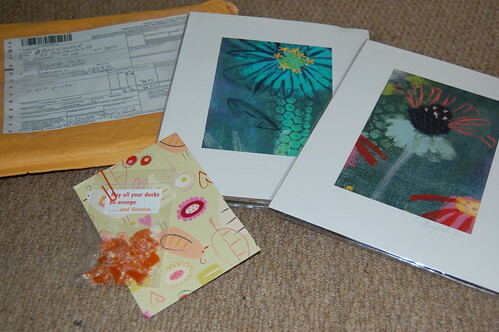 First a fab parcel from Amy Schimler,two prints from her Etsy store,and she also sent a little postcard and bag of orange licorice ducks...how sweet! 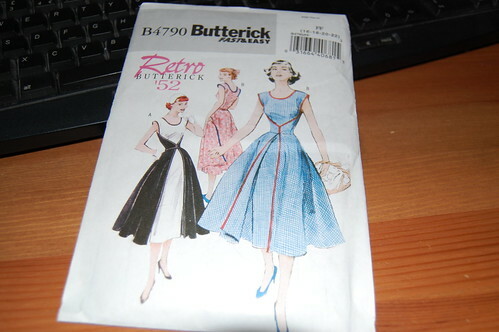 Second a sewing pattern I've wanted for a while,and reminded about it this week reading A Dress A Day,I decided to finally buy it. So the weekend is off to a good start. Now for my second cup of tea before starting on some custom orders.